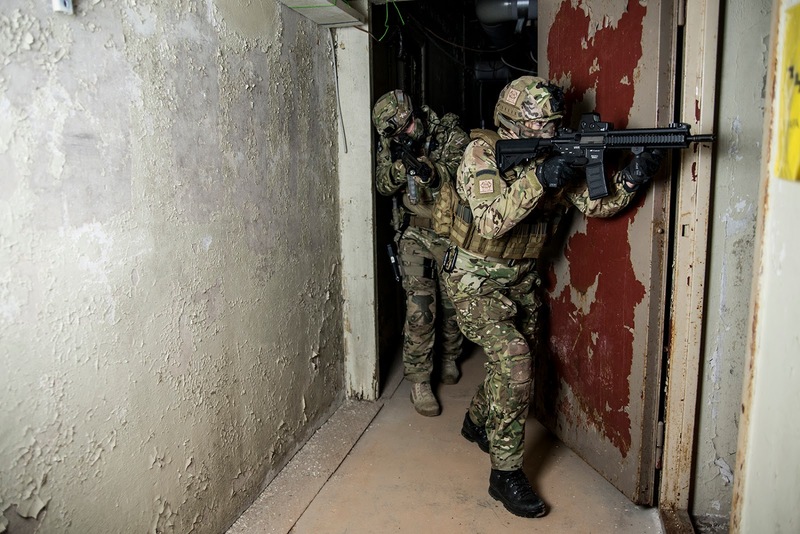 CAMP SOLBACKEN/TJARNAN CQB IN HEDEMORA, SWEDEN BY CALLSIGN HANNA! 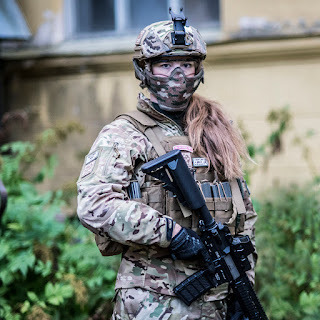 With a growing demand for international content Femme Fatale Airsoft is pleased to announce that we will be having guest bloggers share their experiences and reviews from all over the globe. 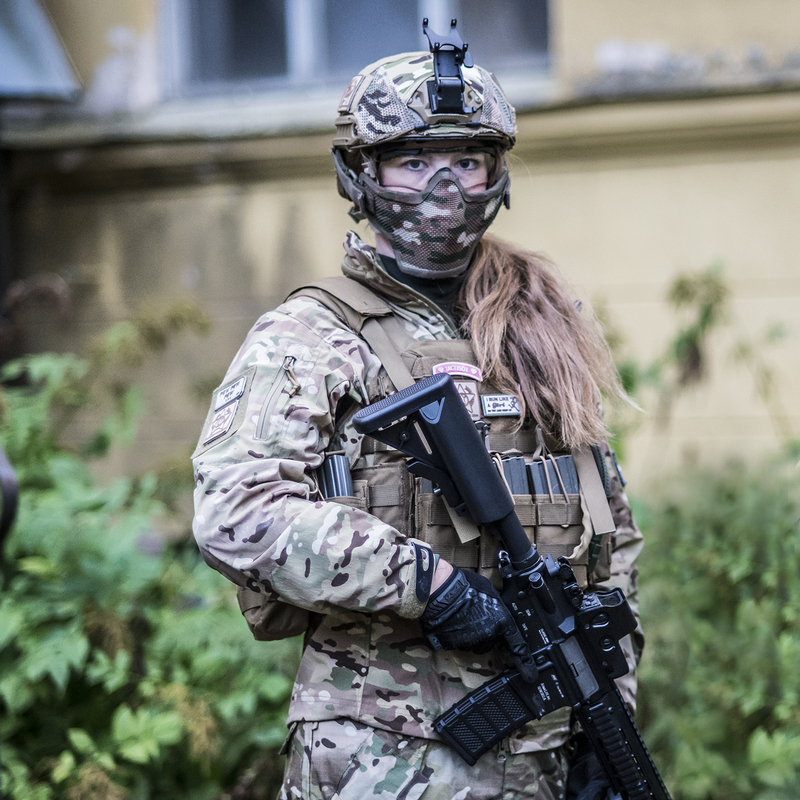 For our first guest blog we have a review on the Camp Solbacken/Tjarnan CQB in Hedemora, Sweden by Callsign Hanna! Check it out below! At an abandoned sanatorium in the Swedish forest of Dalecarlia you’ll find a great CQB location, a welcoming airsoft community and plenty of pyro. It’s pitch black and cold in the basement of the old sanatorium. We’re advancing through concrete floored corridors. A well-thrown grenade later we enter the old boiler room. Weapon lights pierce the darkness whilst we search for the RFID-tag that will show us the next location we should head to in the 4500 sqm large house. 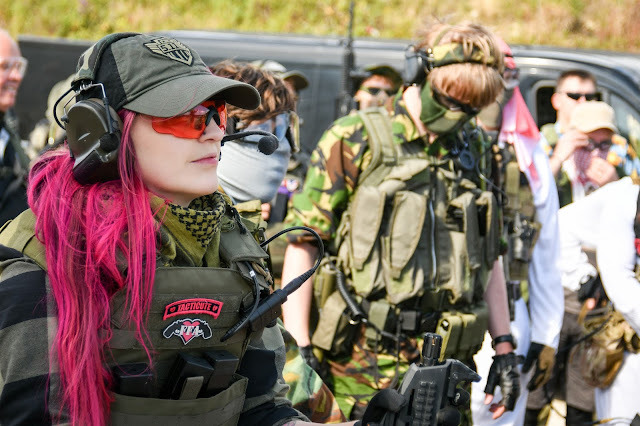 At Camp Solbacken, north of Hedemora in Dalecarlia, Sweden, games are arranged twice a month and they are usually very well thought through and fun to be a part of. During a game day, 4-6 games of roughly 1 hour are fitted in and each game differs from the previous one. An especially fun game is the RFID tag-hunt that was created by members of Team Miffo Airsoft Sweden. Basically participants are divided into teams and each is equipped with a tag reader. You are informed of the location of the first tag and then the game begins. The team need to find as many tags as possible before the time is up whilst encountering fire fights with the other teams. When you find and scan one tag, the reader gives up the location of the next one. Another game that I personally really liked was the “capture the flag” inspired game during which we searched for two hard cases with loudspeakers inside. Once you found one your mission was to keep it until the end of the game. The obstacle: every 30 seconds the hard case made extremely loud noises and flashed coloured lights making the carrier an attractive prey for the opposing teams. I managed to grab a case and then I ran continuously with a handful of teammates for half an hour without a pause up and down and around the entire house until game time was up. The location itself consists of an abandoned sanatorium with three floors plus the basement and a rickety attic. Three large stairwells connect the floors in addition to hidden ladders and sneaky stairways behind doors. The old house is vast so it is quite hard to stay oriented during the very first games if you have never been there before. Though suddenly ending up alone in rooms with old doctors equipment definitely adds some adrenaline to the experience. 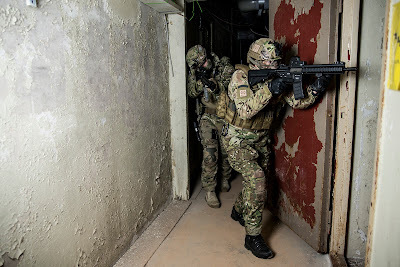 Camp Solbacken is also used by the armed forces to practice CQB in a realistic setting so expect hundreds of rooms, long corridors and a need for explosives. The players here really love pyro and grenades so there is plenty of noise. Wearing active hearing protection is recommended since it is otherwise hard to communicate with your teammates. If you wear earplugs you will feel a bit “out of everything”. Well placed smoke machines, flashing orange lights and weird music in empty rooms adds excitement. A man called Koko usually manages the games and he does this extremely well. If you attend during Halloween or before Christmas he will have prepared treasure hunt games during which you search for hidden skeletons, skulls or mini-santas depending on the season. If you’re out of luck, you might meet the un-killable Death himself in the completely dark rooms downstairs. There is no heating though so during winter games sub-zero temperatures are common. Make sure to bring gear and clothes that work in these conditions. On-site there is a small kiosk where you can get energy drinks, snacks and flash bangs but you really need to bring everything else that you need. However, if you need help with anything, the players here are extremely nice and helpful and will gladly answer any questions and generally help out with whatever they can. The atmosphere truly is great and welcoming. I, who don’t belong to a team, usually travel there alone and always meet great people. On a side note, being a female Airsofter I’m in the minority but that is never an issue here. Everyone is welcome at Camp Solbacken as long as you call your hits and play fair. 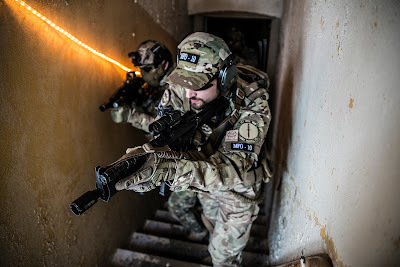 Overall, Camp Solbacken is a great CQB site and a personal favourite of mine. 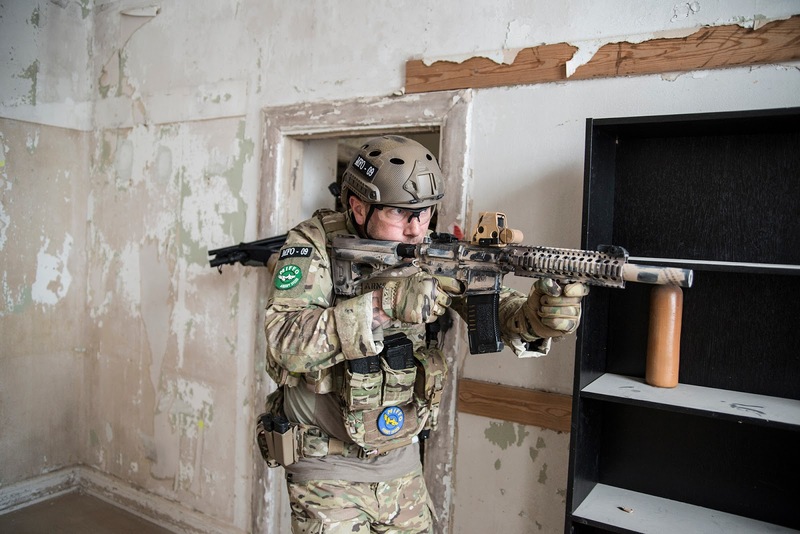 Seeing as I am usually a woodland player (apart from loving games at abandoned soviet army bases…) this really is the location that got me into CQB. 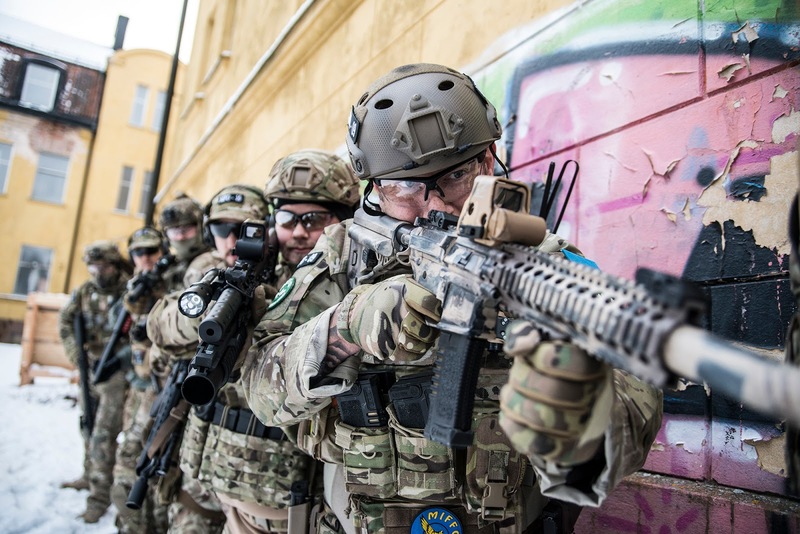 If you enjoy pyro, tight CQB with high levels of adrenaline and meeting some of the nicest players in the Swedish Airsoft community, you should definitely pack you bags and head to Camp Solbacken. – Check out Camp Solbacken on Facebook (https://www.facebook.com/CampSolbacken/) for information on the next game, write a comment and someone will help you if you don’t know Swedish. – There is a maximum amount of players allowed and we Swedes use a thread at the forum www.airsoftsverige.com to reserve a spot but if you are visiting from another country, write directly to Camp Solbacken or Team Miffo Airsoft who has Camp Solbacken as their home site (https://www.facebook.com/miffoofficial/) and they will help you out. – You must wear ear protection in addition to eye pro. There is A LOT of pyro during the games.